The General Chapter of the Order of Preachers has opened! On the feast of St. Mary Magdalene, patroness of the Order of Preachers, little over a hundred Dominican friars from all over the world, elected by their brothers to represent them, celebrated holy Mass in the church of the Holy Cross on the island of Čiovo and thus started the General Chapter of the Order of Preachers in Trogir, Croatia. The Master of the Order, fr. Bruno Cadore, OP, celebrated the holy Mass together with his predecessors fr. Timothy Radcliffe, OP and fr. Carlos Aspiroz Costa, OP. All the members of the Chapter, diffinitors, guests, and hosts alike participated in the liturgical celebrations. The church of the Holy Cross and the Dominican convent of the same name were built on the 15th century. The builders of the church could have never imagined a General Chapter being held inside its walls. 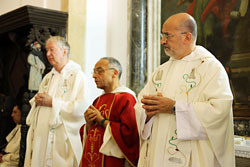 During the first plenary session, the Provincial of the Croatian Dominican Province, fr. Anto Gavrić, OP, welcomed all the members of the Chapter. The Mayor of Trogir, Mr. Ante Stipčić, also welcomed the capitulars on behalf of all the citizens of Trogir and the surrounding area. The chapter’s work started in good spirits. During the afternoon session Msgr. Želimir Puljić, Archbishop of the city of Zadar and President of the Croatian Bishops Conference visited the chapter and in a short address welcomed all the delegates to Trogir and to Croatia. Some of the important topics that will be discussed by the delegates during the various plenary and work group sessions are: Jubilee of the Order in 1216, preaching, formation, study, common life, government and continued renewal of the Order. The first day of the General Chapter ended with the solemn notes of vespers spreading through the hallways and the cloister of the convent of the Holy Cross. After evening prayer there was a Rite of Reconciliation and Eucharistic Adoration. The Chapter is expected to convene and continue its work until August the 8th 2013. This entry was posted in Events by Christopher. Bookmark the permalink.